OSWEGO, NY – On Oct. 28, Donald Todd told the Oswego Sunrise Rotary club why he should be elected Oswego County Court Judge. 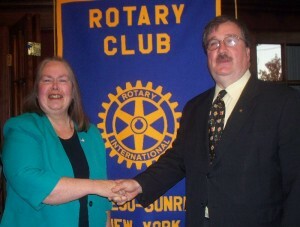 Rotary President Carol Reed and Oswego County Court Judge candidate Don Todd. Both candidates for County Court Judge were invited to discuss their qualification, but Don’s opponent chose not to speak. Don is a member of the Sunrise Rotary and Oswego Elks Lodge. He serves meals on wheels and is a member of many other organizations. He is currently First Assistant District Attorney for Oswego County. Don has extensive legal experience in the criminal justice system and has helped keep Oswego County safe. He has served 19 years with the District Attorney and has prosecuted thousands of cases. Don is pleased with the general conduct of the campaign. He complains that his arm is sore from all the hands he has shaken, but he has enjoyed the campaign.